The next School Committee meeting will be held on Wednesday, April 24th at 7:00 p.m. in Room H100 in the Framingham High School. A School Committee meeting will be held on Wednesday, May 1st at 7:00 p.m in the Memorial Building's Blumer Room. The Framingham School Committee is comprised of nine (9) members. Members shall be nominated and elected from each of the nine (9) districts into which the municipality is divided under Article VII, section 3. The mayor shall serve, by virtue of office, as an ex-officio member of the school committee and shall only vote to break a tie vote and shall be ineligible to serve as chair, vice-chair or clerk. 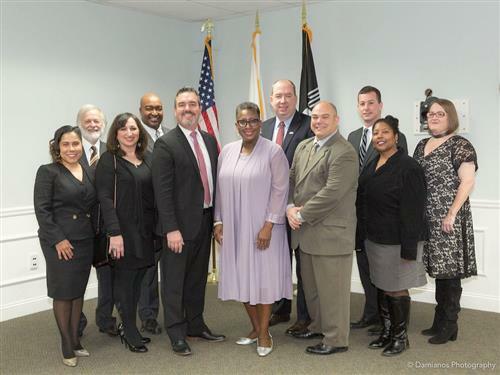 The term of office for the nine school committee members elected by the voters shall be for two (2) years, beginning on the first day of January in the year following their election, and shall continue until their successors have been qualified. Meetings are also streamed live on the Framingham Public Schools' Facebook page. Video On Demand of past meetings prior to August 1, 2018 can be viewed on www.framingham.k12.ma.us. Click on the FEC-TV Icon on the top right portion of the FPS home page, and select Video on Demand from the menu bar on the left hand side of the FEC-TV home page. Video On Demand from meetings from August 1, 2018 on can be viewed on http://www.framinghamtv.com/ as well as the schedule to view rebroadcasts.